There are certain recipes that stay close to our heart for several reasons and this is one among them. 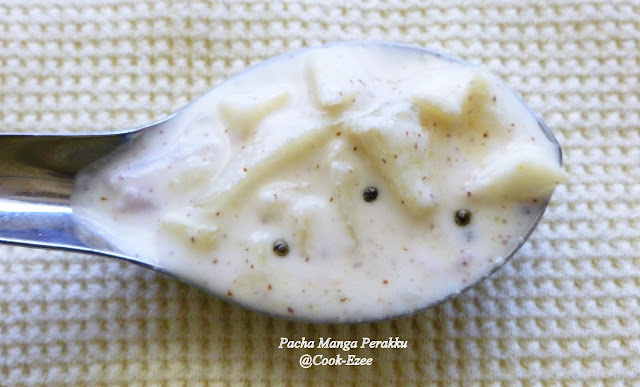 This is again my granny's recipe and is quite similar to Pacha Manga Pachadi - Cooked Raw mango in ground coconut and yogurt, but this do not require any cooking other than for the seasoning part. 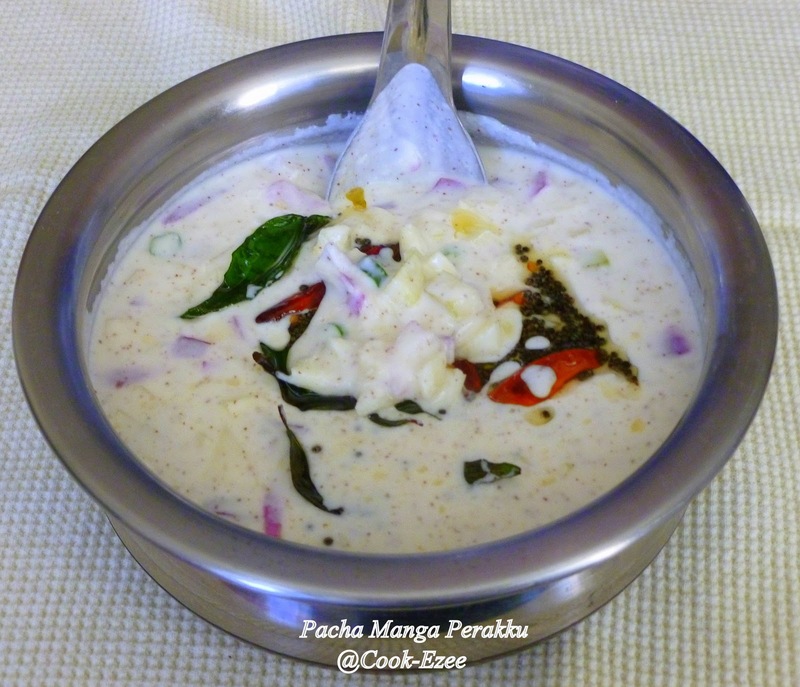 'Perakku' simply means 'mix' in local Kannur/Tellicherry Malayalam and just as the name says it is a mixture of raw mango and few ingredients. As I mentioned before when we were kids there were hardly any days when our Meenkaran(fisherman) did not bring fresh fish at our door steps. My grandma knew very well unless we get Meen(fish) curry or Fry it is hard to make us eat even a gulp of rice especially my little sister who was a very picky eater then. 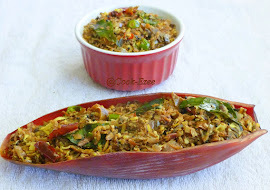 There were few simple tricky condiments/side dishes/curries which my grandma use to prepare to make us eat rice such as unakkamean(dry fish) fry or chammanthi(chutney), Puliyum Mulakum - a combination of tamarind with green chilies, shallots n salt, many more quick side dishes and of course her very own 'Perakku'. She prepares different kinds of perakku like onion perakku, onion-tomato perakku, raw mango perakku etc among which this one was our favorite. 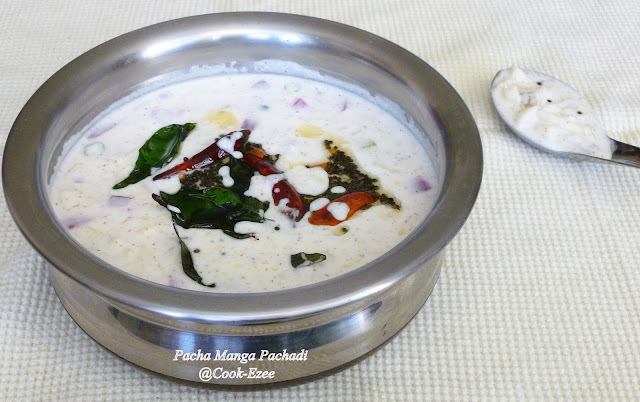 Try this out for a jiffy side dish for any flavorful or plain rice/Parathas. Enjoy!!!! Wash and peel the skin of raw mango, chop them into fine cubes and put them in a bowl. Add the chopped onion, green chilies, ginger, few curry leaves and salt to the chopped mango and mix it well with your clean hands or toss well to mix everything. Make a fine ground paste of coconut and mustard seeds with very less water(use water just to get it ground) and add to raw mango mix. With a fork or spoon slightly beat the yogurt just to remove lumps if any and add it to the raw mango mix and stir slowly to mix everything. Check for the salt and adjust accordingly. 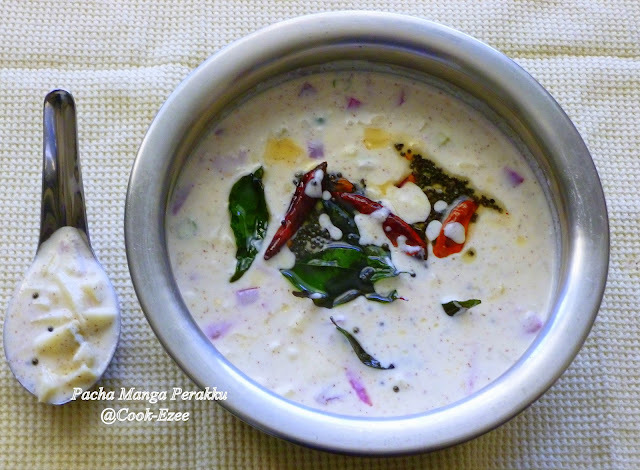 Heat a small frying pan, pour coconut oil, crackle the mustard, add the curry leaves, dry red chilies stir for few seconds and take off the stove. Pour them to the prepared Raw mango mix/perakku. 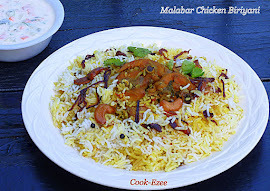 Serve with Plain Rice or any flavorful Rice or Paratha. 1. Adding onion is optional, you can opt out that if you are not an admirer of raw onion. I add it sometime, skip sometimes. 2. You can crush the mangoes in a food processor, just be careful not to blend it. It should be small but bite pieces. 3. You can make the same without raw mango, just onion mix/onion-tomato mix/pineapple mix or any fruit/veggie of your choice. this dish is very new to me..congrats on your kerala kitchen award..
New one, thanks for sharing, very refreshing pachadi..
Nice recipe. Thanks for sharing..
That is an all time fav raita - Looks great - thanks for linking to my event dear! mouthwatering here...love raw mangoes n this sounds so yummy!! 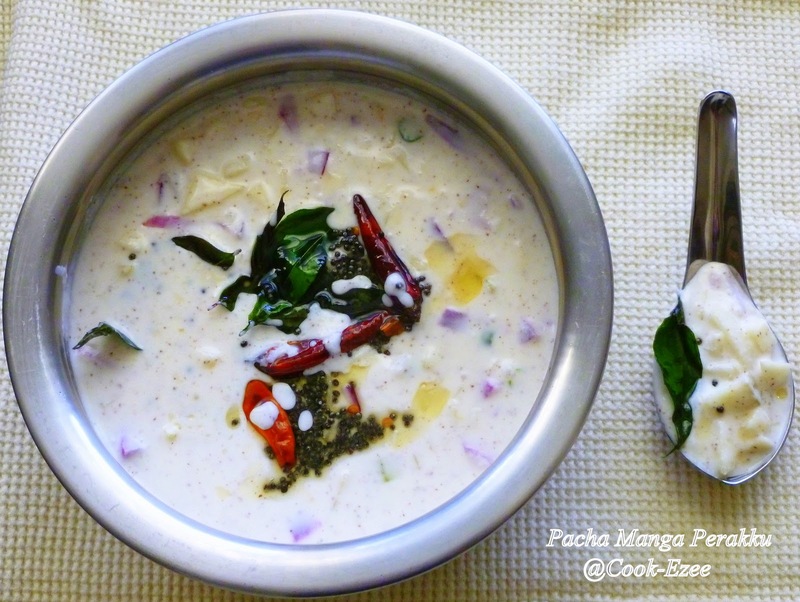 Very lovely similar to pachadi ,new to me..Quick yet love the tangy flavors!! Nice flavors !! very interesting !! This looks so good, love it. I can already get the tangy feeling from the photographs..nice recipe. Perakku looks so delicious..its one my fav..love it! The recipe is just perfect and the gorgeous presentation makes it even more appealing. I am drooling!! Bookmarked for sure! Wow dear, am so amazed at the clicks. 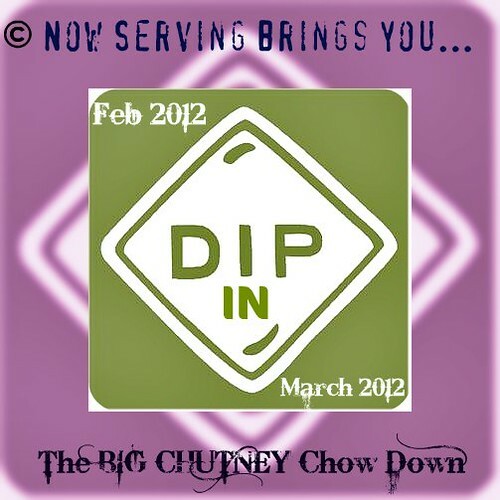 You have posted one of my favorite dishes. have got to try this now..! Yummy..!